LONDON, UK, January 19, 2011 (ENS) – The EV Cup – the world’s first circuit race series for zero-emission electric vehicles – will hold its inaugural season of seven races this summer and fall. The London-based company behind the races announced the new green motorsport race circuit and displayed models of the race cars at last weekend’s International Autosport Show in Birmingham. EV Cup races are planned for tracks in the UK, Portugal, Spain, and the United States, with a city street race also slated for the near future. “The electric car is already changing the world and soon will begin to revolutionize the face of traditional motor-sport across the world by embracing the issues of the day from straightforward zero emissions, to eco-friendly cars, sustainability and corporate social responsibility,” said Sylvain Filippi, director of the EV Cup. “We believe the commercial world will take notice when they begin to recognize a new opportunity to partner with a new and exciting sporting event like the EV Cup and add significantly to their sustainability credentials,” Filippi said. The EV Cup is the first green motor racing series based totally around zero-emission electric cars, providing the platform for sustainable motor sports. 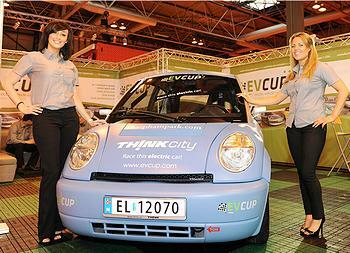 EV Cup cars will compete in two main classes. In the City EV car class, racers will drive carbon-free, race-prepared urban THINK cars. Created by the Norwegian company, THINK, for urban driving, these cars have been made race-ready by an EV Cup team of specialists in London, who stripped down the interior to one lightweight racing seat and steering wheel, and replaced all glass with lightweight heat resistant, shatterproof material. The Sports EV class will feature teams racing 185 kph (115 mph) Westfield iRacers. Developed by Britian’s Westfield Sportscars, this race car is powered by lithium ion phosphate batteries and features a feather-weight lycra skin over a lightweight aluminium framework. A third category, the Prototype EV class, will not feature races, but rather base its results on time trials that showcase the latest non-production electric vehicles on circuits through street and race courses. 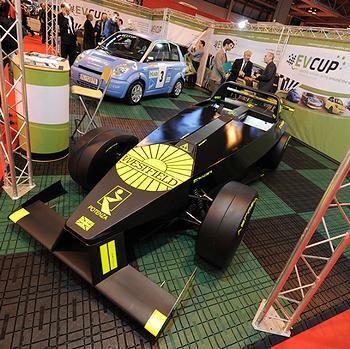 Models of the THINK City EV Cup Edition and the Westfield iRacer were on display this past weekend at the International Autosport Show in Birmingham, England. Race days will include qualifying rounds and all car batteries will be recharged at on-site facilities. Each sprint race will be contested over 20 to 30 minutes of competitive laps. Several tracks and dates in the UK have been confirmed, including Silverstone on August 6, Snetterton on August 20, Rockingham on September 10, and Brands Hatch on October 23. “Racing electric vehicles should convince the wider public of their potential. Racing was initially used to develop and prove a new product called the motor car. I see no reason why electric vehicle development will not benefit in the same way,” said Hill. To that end, the EV Cup last week announced a new partnership with CAA Sports, a division of Creative Artists Agency, to create opportunities for corporate partnerships, business development, brand marketing and event management.